Kit includes materials and instructions to complete one Silver Dura-Lar Streamer. This material is quickly becoming the product of choice among competition fliers! Bright, mirrored silver material, 2 mils thick. Durable and takes a nice crease for folding those comp streamers! Although designed primarily for competition, may also be used for sport models. Bright and durable silver streamer kit for Model Rockets. 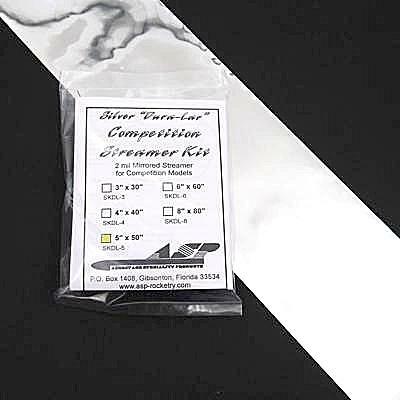 Silver Dura-Lar Streamer Kit 5" x 50"